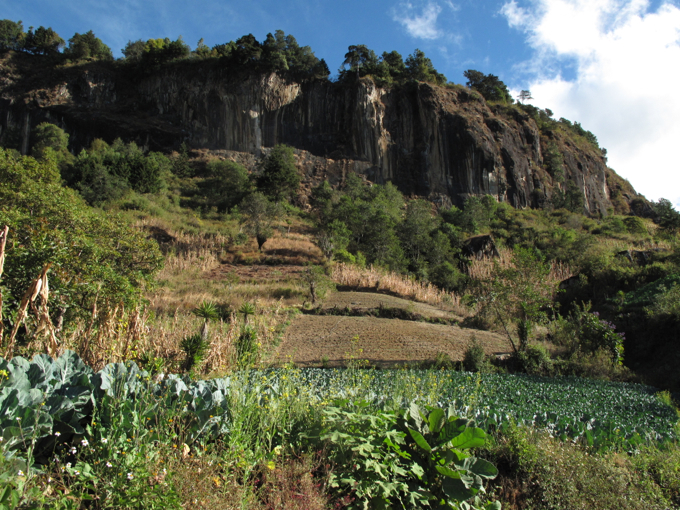 The main purpose for our visit to Xela was to join a 3-day trek in the Guatemalan Highlands from Xela to Lago de Atitlán. 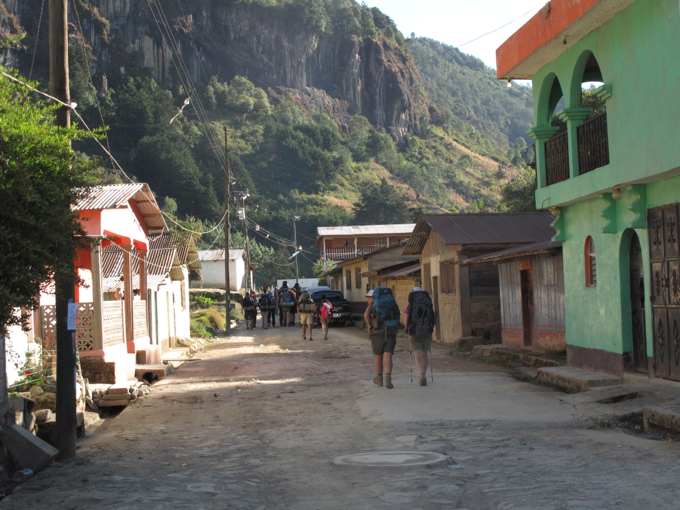 The trek was organized by Quetzaltrekkers, the only all volunteer-run trekking company in Guatemala. These volunteer guides commit to a three-month tour of duty, receiving no pay for their efforts. 100% of the profits generated by the treks are used to support a school and dormitory for some of Xela’s neediest children. As Americans, we were proud that many of the guides were from the States; their commitment and enthusiasm was impressive, and we were happy to support their cause. 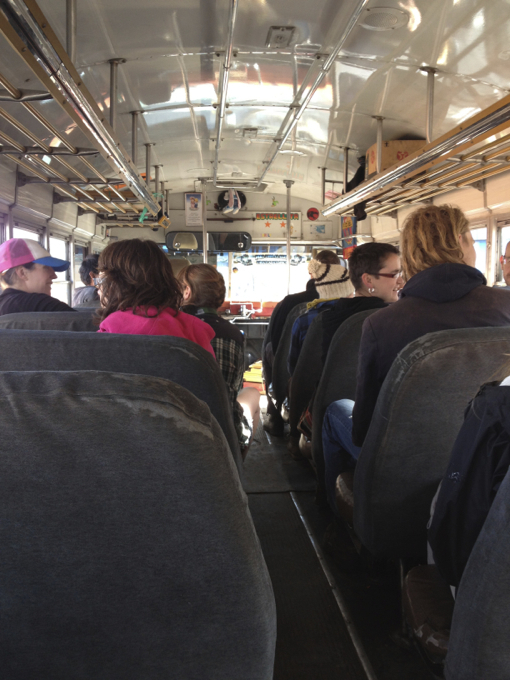 We caught a chicken bus to the nearby village of Xecam to start our trek. Chicken buses are ancient American school buses used for local transport to almost anywhere in Guatemala. It was hard for these two teachers not to feel that we were on a field trip! The trek itself was a challenging 45 kilometers topping out at just over 10,000 feet. 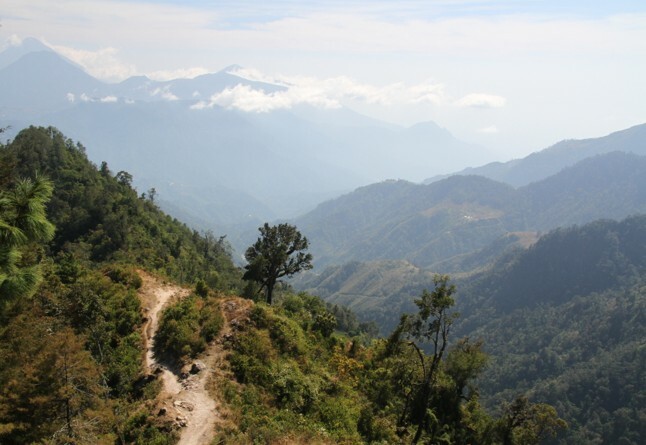 The first day started with a steep, hour-long ascent to the high point of the trek. From there, it was almost all downhill (figuratively, of course) through steep ravines, cornfields and friendly villages. After logging twenty kilometers, we bunked down for the night in the town hall of the small indigenous village of Santa Catarina Ixtahuacan. There, we were treated to a relaxing, steam sauna in a traditional Mayan temascal, where we could soothe our tired muscles and rinse off the thick layers of dust that had accumulated on us over the course of the day. Lest you think that we have become soft in our old age, we assure you that a temascal sounds way more charming than it actually was. Ours was located in a friendly villager’s backyard, and it resembled a small doghouse more than anything spa-like you might be imagining. After crawling through the tiny entrance, we sat on a low bench wondering what to do. Once our eyes adjusted to the darkness, we started to figure things out. In one corner, there was a set of hot coals which kept a large cauldron of water at a low boil. Another cauldron collected cold water from a garden hose. Flicking the cold water onto the coals produced steam for our sauna, and we could mix the hot and cold water to our liking in a large plastic bowl for a pleasant sponge bath. By the end, we were definitely cleaner, but we smelled quite strongly of campfire. It was not a 5-star experience, but it did the trick for these two weary hikers! 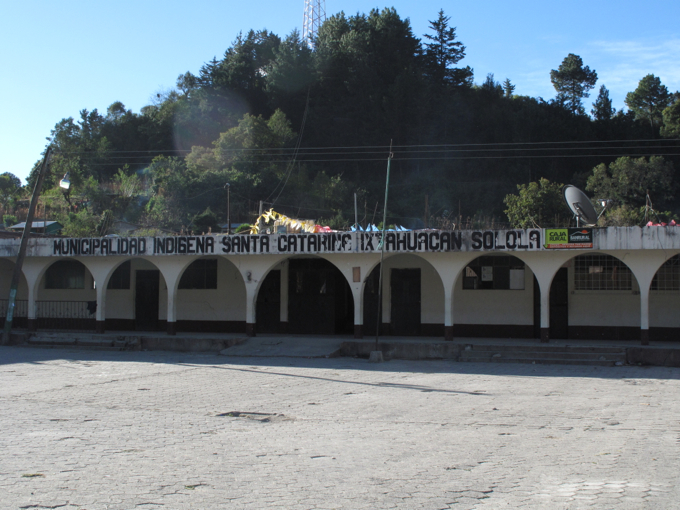 The town hall in Santa Catarina Ixtahuacan was our home for night one on the trail. Our second day on the trail was another long, dusty, 20-kilometer trek. We started nice and early with a tasty traditional rice, bean and egg breakfast at a local comedor. Before long, we tackled the only significant uphill portion of the day. The slog up “Record Hill” (named by the QT guides who have conquered it in an impressive nine minutes!) wasn’t too taxing, especially now that we had a full day of carrying packs under our belts. At the top, we caught a glimpse of the Pan-American Highway, which stretches all the way from Alaska to Argentina. What a trip that would be! Breakfast at this local comedor provided good fuel for the trail. Dramatic cliffs flanked our path. After lunch, we descended to the Payatza River, where we changed into water shoes and waded across the ankle-deep water. Our previous experience of fording ice-cold rivers while trekking in Iceland had made us a bit wary of this section of the trail, so we were relieved to find that the crossings were a breeze (at least for us in the dry season). Over the next hour, our path criss-crossed the river seven more times, and we found ourselves lingering in the cool, refreshing waters to help soothe our aching feet. Just before nightfall, we arrived in the village of Xiprian at the home of Don Pedro, a prominent villager who opens his home to QT groups for dinner and a night’s stay. We were greeted with fresh fruit liquados, which were followed by a delicious, home-cooked meal. Well-sated, we laid out our sleeping bags in the dining room and tried to get a little rest before our early morning wake up call. At 3:45 am, we awoke and packed as quickly as possible. A nearly-full moon lit our path as we made our way in the dark to a mirador above Lago de Atitlán. At the viewpoint, we pulled out our warmest clothes and sleeping pads to insulate us from the chilly temperatures as we waited for the sun to rise over the lake. 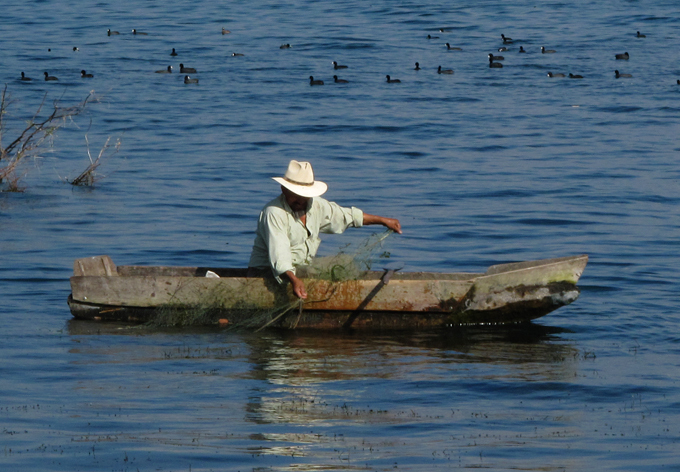 Guatemalans often tout Atitlán as “the most beautiful lake in the world,” so we were eager for a glimpse. In the dark, we could make out the outlines of several volcanoes, and we could even see fiery red lava atop one of them. Eventually, the sky turned a dazzling shade of pink and orange as the sun shyly peeked over the ring of volcanoes surrounding the lake, slowly illuminating its calm reflective waters. A band of clouds had gathered like a puffy collar around the impressive peaks; lush cliffs cascaded down toward the shore of the lake. It was a beautiful sight! This magnificent sunrise made getting up at 3:45 am worth it! 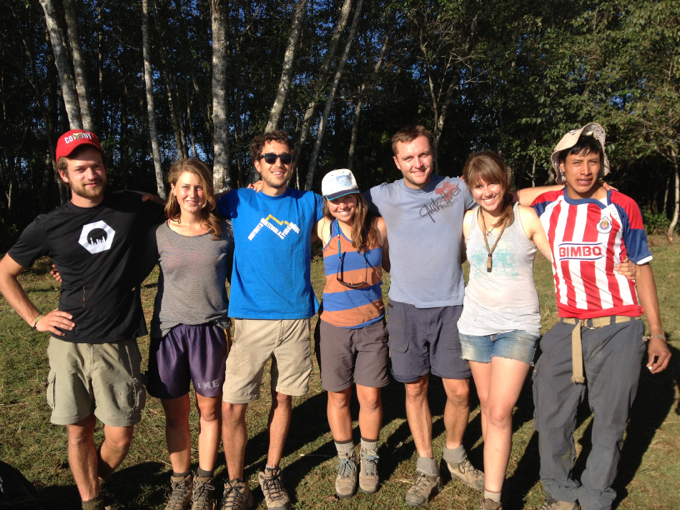 The Quetzaltrekkers guides were an inspiring bunch. As the sun climbed higher in the morning sky, we enjoyed hot beverages and moshi, a hot cereal similar to oatmeal but with even less flavor (if you can imagine!) and greeted the new day with a few sun salutations. 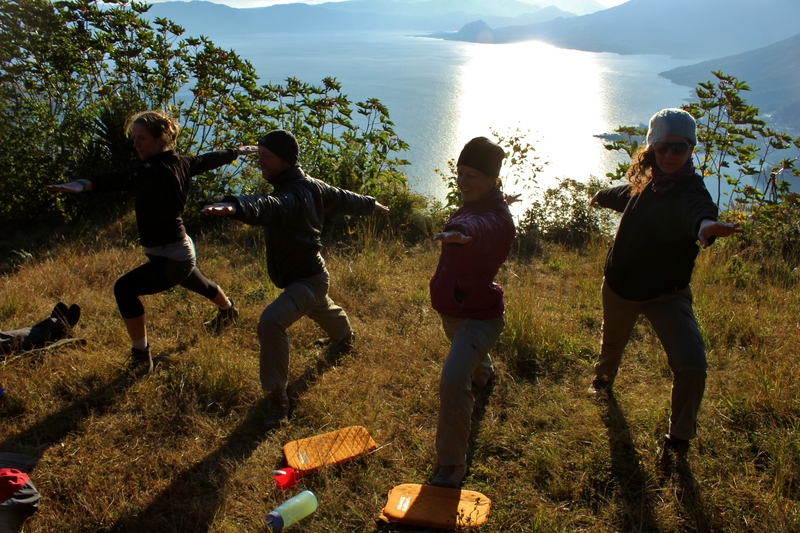 Yoga warriors above Lago de Atitlan. This awesome shot is courtesy of fellow trekker Melissa Denchak. Once the sun was up, it was time to head down to the lake. 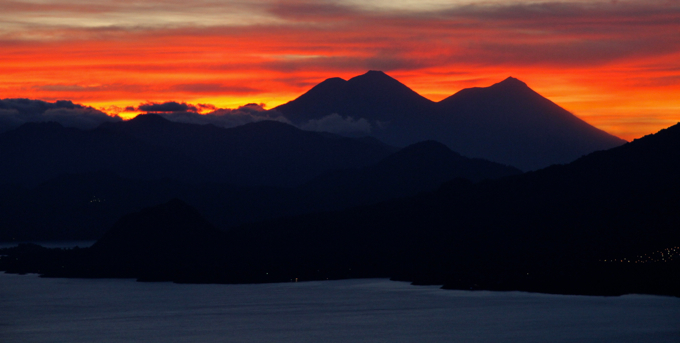 Atitlán was formed when three volcanoes in the area erupted and collapsed to form a huge caldera that was subsequently filled with water. We slowly picked our way down the trail, dropping from the rim of the ancient volcano to the town below. 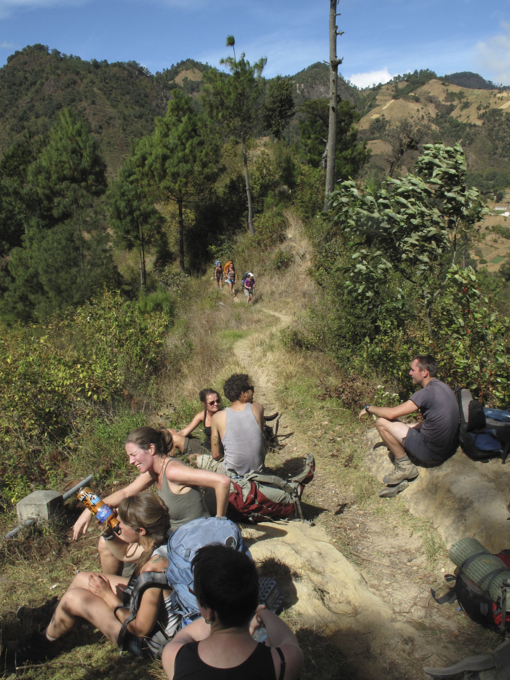 The descent to Lago de Atitlán was the steepest of our trek. Our trek officially ended at Hostal Casa Blanca in San Pedro de la Laguna, where we were treated to a fantastic vegetarian buffet of Middle Eastern dishes. Apparently, there are large numbers of Israeli tourists in Guatemala, and with that comes the bonus of amazing falafel. After three days of strenuous trekking, we had built up monstrous appetites; we happily stuffed ourselves and toasted the successful completion of our trek with of our fellow hikers. 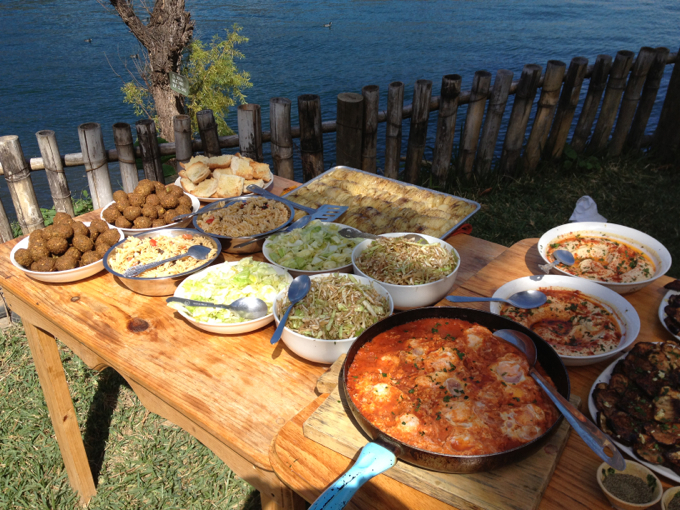 The scrumptious spread at Casa Blanca was a sight for sore eyes! Cheers to the completion of a great hike! The last day of our trek happened to be New Year’s Eve. Quetzaltrekkers sponsored a progressive fund-raising party in town later that evening. San Pedro is known as the party town of Lago de Atitlán, and it has the feel of a miniature Khao San Road. Travel agencies, international cafes, an abundance of cheap hostels and numerous bars cater to the backpackers that flock here. From the looks of things, it seemed like a few ex-pats have taken up permanent residence. After cleaning up and relaxing for the afternoon, we headed out on the town to greet 2013, Guatemalan-style. By early evening, everyone was out on the town celebrating. Guatemalans love to set off homemade firecrackers on festive occasions, especially New Year’s Eve. The combination of grizzled ex-pats, young backpackers and firecracker-wielding locals made for a raucous and somewhat dangerous scene. Despite the general madness, we braved the local traditions and managed to stay up well past midnight for the first time in years. After a lazy morning, we wandered down to a local sports pub, and, through the miracle of satellite TV, we were able to watch our alma mater Northwestern win its first Bowl game in over 60 years. Go Cats! We spent the rest of the afternoon relaxing back at our hotel, swinging in the lakeside hammocks and admiring the abundant birdlife. Lago de Atitlán makes for a tranquil place to spend a few days chilling out after the dust and sweat of the trail. 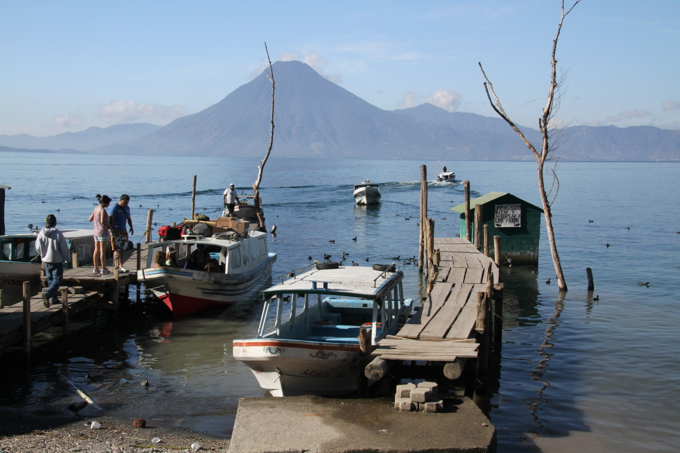 San Pedro sits on the shores of Lago de Atitlan. Fishermen use traditional methods to make their catch. 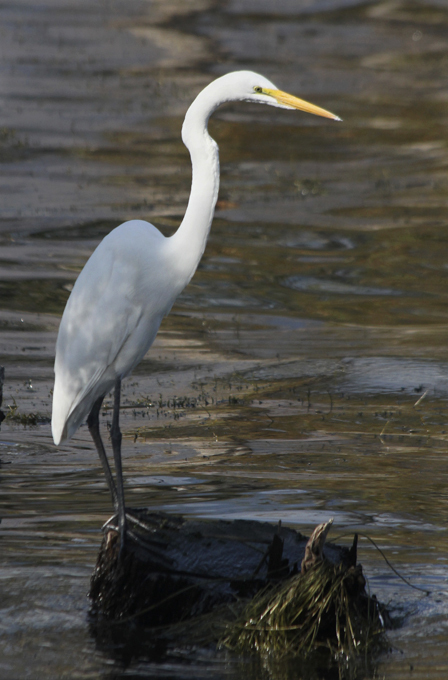 An abundance of birdlife lives on the lake, including this heron. 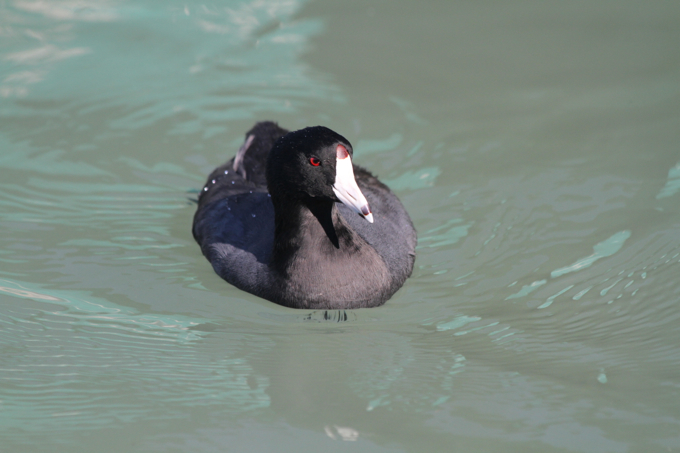 Huge flocks of grebes can be spotted from the shoreline. You can visit the many towns around the lake by boat. 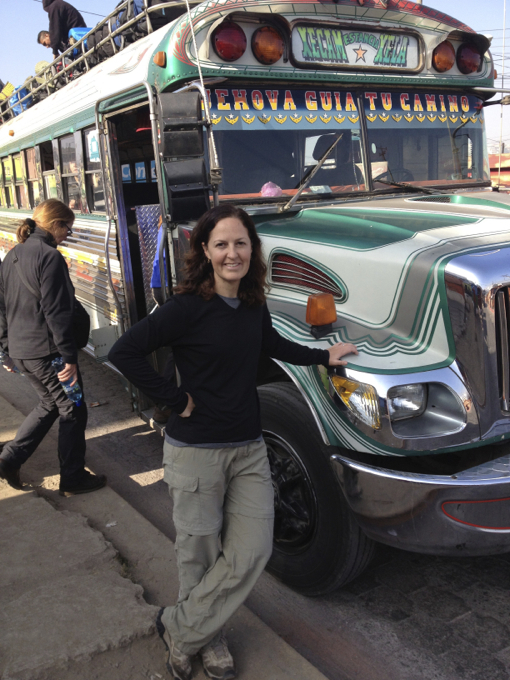 Travel Logistics: We reserved spaces for the Xela-Lago de Atitlán trek online before we left Chicago, but you can book directly at the Quetzaltrekkers office in Xela. They keep a regular schedule of treks, so check out their calendar here. 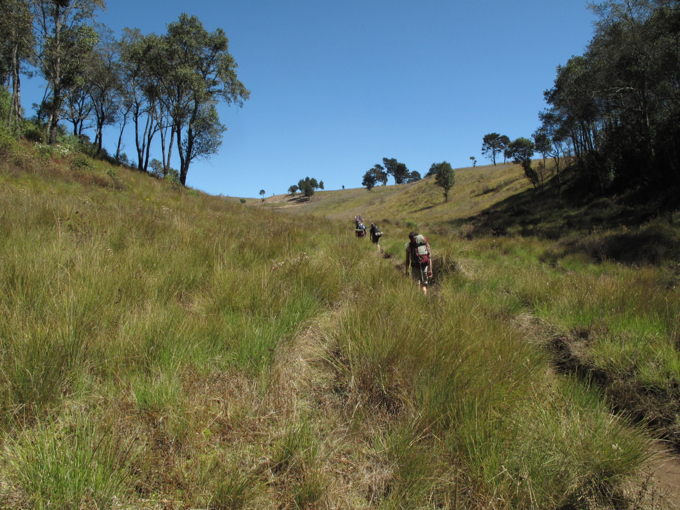 Quetzaltrekkers is a truly admirable organization, and we found this trek to be our most rewarding experience in Guatemala. While the scenery on the trek was not as spectacular or as pristine as we had hoped, we really enjoyed meeting all of the interesting international travelers in our group, and the wonderful conversations we shared certainly made the 45 kilometers of the trek fly by. The guides were super-friendly, and they worked hard to make sure that we were having a pleasant experience. The trek itself was not too difficult, although there were many steep downhill sections where we were both quite happy to have our trekking poles that we brought with us from Chicago. Quetzaltrekkers generously supplies all other hiking equipment that you could possibly need (backpacks, hiking boots, sleeping bags, etc.) for a small deposit returned at the end of the trek provided the gear is undamaged. They even delivered our other bags to us in San Pedro making it unnecessary to backtrack to Xela to retrieve them. 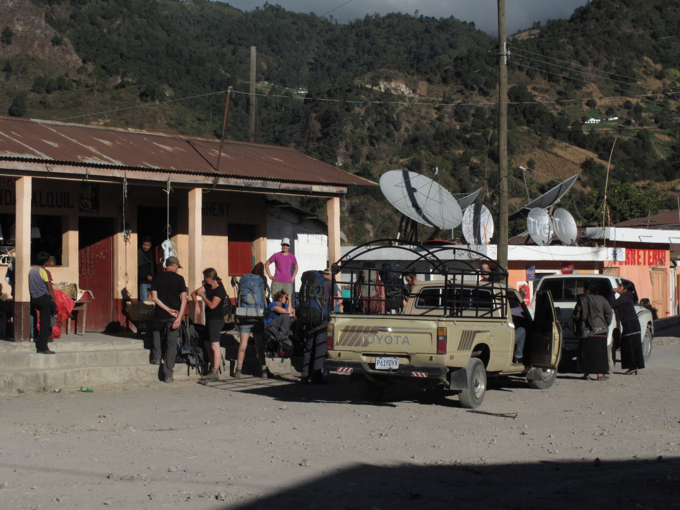 Quetzaltrekkers makes trekking in the highlands as simple as showing up to a 6am breakfast in Xela on departure day. And with all of the profits going to such a good cause, it’s a no-brainer. If you find yourself in Guatemala, consider this a must-do experience! Want to know more? 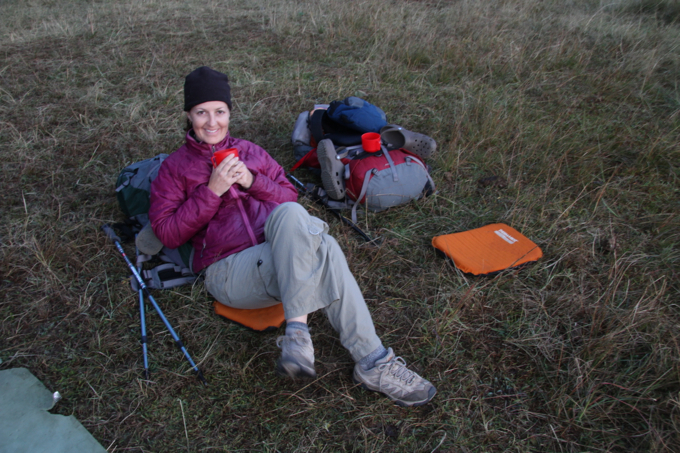 Click here to read fellow trekker Melissa Denchak’s account of our experience. Melissa and her fiancee Shon are Americans working and living in Panajachel on Lago de Atitlán. 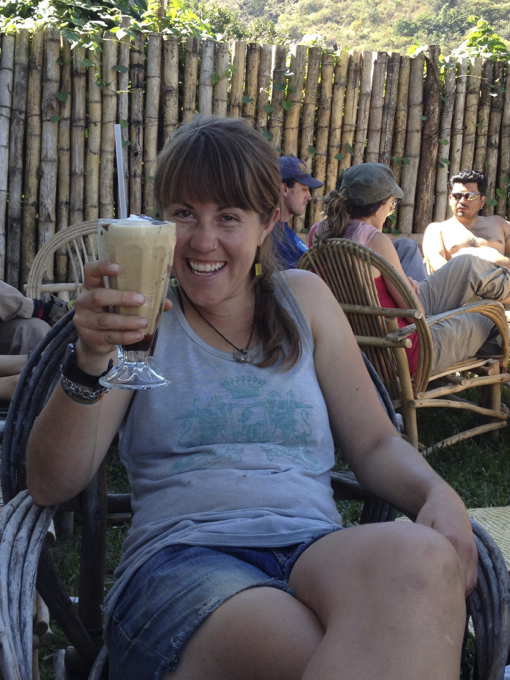 She is an incredibly witty writer, and you might enjoy some of her other posts about expatriate life in Guatemala on her blog: notquiteroughingit.com. I would have done that hike just for that sunrise shot of the mountains. Awesome! Thanks, Chris. It was a spectacular scene. We were only wishing that we had carried a tripod! Thank goodness for high ISOs, right? Wow… I love your post–both the visual and the text! I was just in Guatemala a couple of weeks ago to look at the work of the Integral Heart Foundation with the indigenous population. As part of a side trip, I went to Lake Attitlan and absolutely loved it. I pressed an article recently about coffee and social inequality in Guatemala. I’m sure you have seen plenty of both in your travels. Well… take care…. I’m hoping to be a more frequent flier on your blog. Thank you, Pat! We invite you to visit our blog as often as you like, and we will be sure to check out yours, too. We appreciate your support! You’re welcome. It’s well done. This is a nice travel blog about Lake Attitlan one of the places I visited on my recent trip to Guatemala. It provides some additional context to my article on coffee and social inequality in Guatemala. It a land of stark contrasts, physical and social. ; ). Thanks for mentioning my blog, too–such a nice surprise! Glad you were able to use that photo, though you took some amazing ones yourself–I love the colors of the sky in the sunrise shot. Beautiful. Thanks, Melissa. We love your blog and hope that we send some traffic your way. We agree–that Mediterranean spread was so delicious that it is definitely worth a trip back to San Pedro for that alone!